The Manitoban has once again decided to take on the task of selecting a handful of the many bands in Winnipeg we are most excited for. This year we have recruited a few UMFM DJs to expand our list across genres. Michael Elves, UMFM Program Director, host of Thank God It’s Free Range! Spooky Eyes headlined the Big Fun Festival show at the Handsome Daughter Jan. 25 and are looking to record and release songs as soon as possible. Self-described as “power pop for the anxious peeps of the world,” Bailee Woods has released just six songs so far as housepanther, including two versions of the same song, “Train Station Floors.” houspanther’s growth from demo version to the album version (with JayWood’s Jeremy Haywood-Smith) is sizeable, and hopefully 2018 brings more music and collaborations from the emerging artist. housepanther played the same Big Fun festival bill as Spooky Eyes. 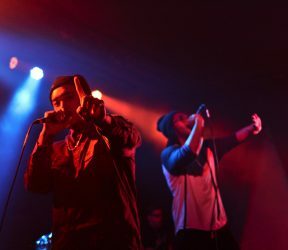 Featured on a roster of local hip-hop artists that were just featured in the Winnipeg Free Press, and spotlighted by station manager Jared McKetiak on his show and the rest is noise, CJ The Grey is part of Studio 393 – a youth-led arts studio dedicated to connecting emerging artists. CJ The Grey plans to release a new single early this year. Speaking of CJ The Grey, he appears on two tracks from the latest album of local beatsmith F.C COCONUT. Released on Bandcamp on Jan. 2, SLOPOKE features a handful of other talented musicians including members of 3PEAT and Super Duty Tough Work. 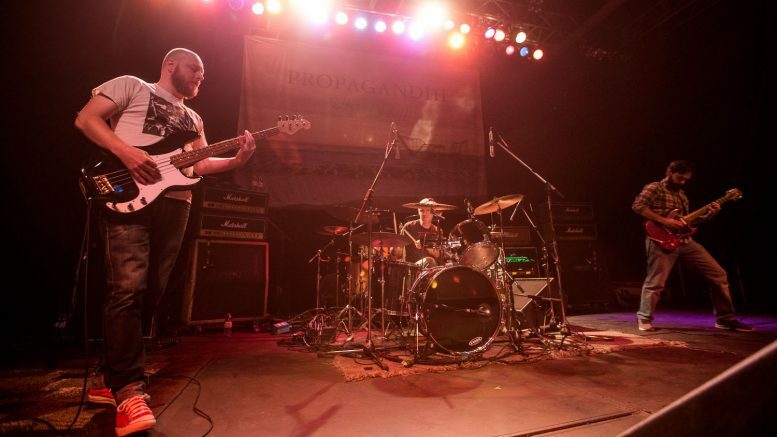 Agassiz’s first show was in October last year opening for Propagandhi at the Victory Lap album release show. Without a doubt, this is going to be a band that you want to look out for in the new year. Agassiz is a three-piece instrumental rock outfit, and their songs contain math rock-inspired grooves, exceptional use of dynamics, intricate chord voicings, and lush soaring melodies. The band is made up of an all-star cast of local punk-rockers: David Guillas (ex-Propagandhi/Giant Sons), Derek Hogue (ex-G7 Welcoming Committee), and Ryan Nash (Union Stockyards/Agapito). Agassiz is planning to hit the studio in the early summer with John Paul Peters at Private Ear Recording in an effort to release a full-length record for this upcoming September. In the meantime, prepare to catch them playing live after the snow melts. Established in the spring of 2016, Stickaround came out of the gate swinging with a five-song, self-titled EP that pays homage to their roots and number one love: good punk rock. In the rise of the new year, the band will be releasing a new full-length record titled In This Life…. Winnipeg power-trio Lonewolfe is ready to hit us with a brand new full-length record. Expect to hear some fresh tunes under a new band name that is yet to be announced. Their songs are exceptionally well-crafted with honest lyrics, infectious hooks, and solid instrumentation. Those key elements are why this punk-rock powerhouse can’t be stopped. In 2018, Clipwing will be releasing their first full-length album as well as hitting the open road to play shows across Canada. In the meantime, check out their latest 2-song EP, Dirty Lights and Wet Streets. If you have yet to do so, 2018 will be the perfect year to dive into the breezy, sunny, and downright weird universe of Human Music. Effortlessly crafting cathcy tunes that would fit right in on a 1980s The Flying Nun compilation, they are showing no sign of slowing down this year. While their latest self-titled record came out in December, an official release show is planned for Feb. 18 at The Good Will Social Club with the equally wonderful Mulligrub. The record release will be the perfect opportunity to catch their instrument-swapping, carefree and captivating live performance before they take it on the road for a tour of Western Canada this summer. Fans of inventive and expertly crafted indie rock, please take this advice: do not sleep on Human Music. Mulligrub is a force to be reckoned with. After 2016 saw the release of their fantastic first full-length album, Soft Grudge, Mulligrub spent last year on multiple tours of North America. The band is back to work in 2018 and focused on writing and recording their highly anticipated second record. After a successful Canadian mini-tour last year and plenty of electric local shows, the new-wave project of James Hofer is set to spend the year writing and recording his first full-length record with another tour of Canada thrown in for good measure. Viva Non has already started 2018 off on a high note with an impressive opening set for Toronto punk-rock outfit METZ at The Good Will Social Club. With members of Basic Nature and Living Hour, Veneer is something of a Winnipeg supergroup, and their first track, “Across” from Real Love’s Beach Station Blues V compilation, surpasses even the loftiest of expectations with ease. Between recording their first EP, a mini-tour of Canada, and helping out with the Winnipeg chapter of Girls Rock Camp, 2018 is already looking to be a stacked year for the band. The hip-hop trio took 2017 by the horns, claiming it as their biggest year yet, and has no plan of slowing down for 2018. 3PEAT is made up of rappers Steve, E.GG, and Dill The Giant, who command the attention of crowds and airwaves, whether they are rapping alongside bands such as Super Duty Tough Work, collaborating with local hip-hop artists, or opening for local favourites across genres. 3PEAT performed at a steady stream of shows last year, including music festivals such as Real Love and Rainbow Trout, opened for Attica Riots, and will play a sold-out Festival Du Voyageur show with Attica Riots and Royal Canoe on Feb. 24. 3PEAT is set to release a new album this spring, heading on a European tour in May. E.GG and Steve are also planning on releasing music individually throughout the year. Marisolle Negash is one of Winnipeg’s few jazz-style songwriters active in the hip-hop scene. Her smoky vocals pair nicely with the modern piano stylings she favours. In the past year, she has begun performing on a regular basis at places such as Winnipeg coffee shop Forth and holding it down alongside bands like Super Duty Tough Work and 3PEAT. Her dedication shows in more ways than one by making appearances at local jams and performing seemingly non-stop. Watch out for more releases and performances in the coming year. Hip hop is alive and well in the Winnipeg music scene, thanks to the likes of Malcolm-Jay. A young, contemporary, and confident artist, Malcolm-Jay released The Enemy Within last year and has performing regularly since. He has collaborated with the likes of MC Woke and CJ the Grey, and performed alongside Beatox. Keep an eye on Malcolm-Jay, as he will definitely be making moves in the coming year. As one of three bands from Winnipeg heading to SXSW this year, people are taking notice of Boniface. 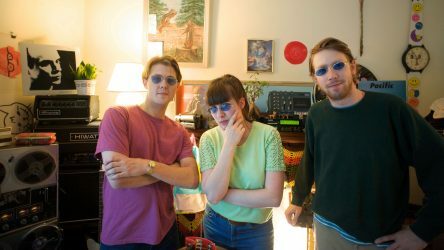 The band, created by Micah Visser, released their album I Will Not Return As A Tourist Dec. 14 last year and Winnipeg has fallen in love with the new pop style of Boniface.